Rajshri Productions is known for showcasing traditional and family values in their films and they will continue this journey with Hum Chaar “Friends Bhi Family Hain”. The movie revolves around the theme of friendship and how friends are the family that we choose. Today Rajshri Productions’ announced the release date of the movie with a quirky new video. One can hear their banter around how friends are the family that we choose, followed by the date announcement. The fun filled chemistry of the four friends is very evident from this video. Helmed by Abhishek Dixit, Rajshri Productions launches four fresh faces with Hum Chaar, Prit Kamani, Anshuman Malhotra, Simran Sharma, and Tushar Pandey. 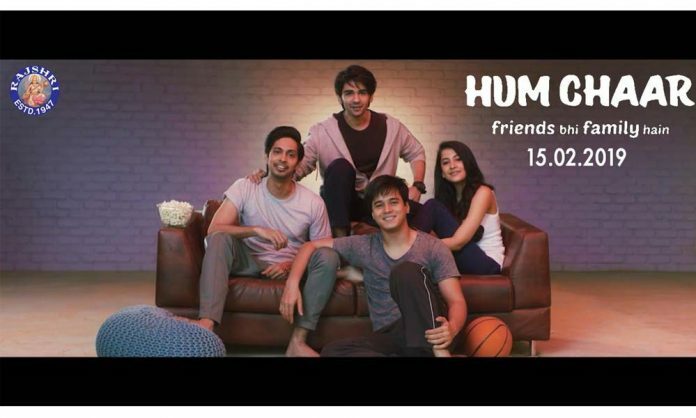 Hum Chaar “Friends Bhi Family Hain” will be releasing on February 15, 2019. Rajshri is associated with blockbusters such as Maine Pyaar Kiya, Hum Aapke Hain Koun…!, Vivaah and Prem Ratan Dhan Payo. Hum Chaar “Friends Bhi Family Hain” is Rajshri’s 58th film and it explores how in today’s world of nuclear family, friends are family too.